The Scituate Land Trust has just completed blazing and clearing at their newest trail system. Another beautiful property at that!! The trails are behind the newly renovated women’s softball field at Esek Hopkins. There are two main loop trails here blazed blue and white with a yellow blazed crossover trail. The trails wander through the thick fern covered forest predominant with tall pines and oaks. There are old fire roads and stone walls that crisscross the property as well. The blue loop climbs over the aptly named “Huckleberry Hill” and the white trail traverses through low lying areas offering glimpses of mushrooms, mosses, and a seasonal stream. There is also an old quarry along the yellow blazed crossover trail worth checking out. The property owned by the State is leased to and maintained by the Scituate Land Trust. There are also several spur trails that lead to private property. Be sure to follow the blazed trails. A trail map should be available soon. Lawton Farm is a Scituate Conservation Commission property on the Scituate/Cranston border. It comprises of a couple large fields with mowed paths. I started the hike from a small parking area at the end of the dirt entrance road. I followed the path a few hundred feet, listening to the sounds of crickets, before turning left. From here I followed the path straight slightly downhill to a stream crossing leaving the front field. After crossing the stream and walking through a short wooded area I choose to follow the path to the left following the tree line. To my right was a field of gold full of blooming wildflowers. At the next intersection I merged right as the path climbed uphill slightly. I saw several grasshoppers along this stretch. At the end of the path I turned right after exploring a tree swing. I continued the walk again following the tree line. I then turned right, quickly followed by a left, and another left again. I followed this path which came to a second stream crossing and back into the front field. At the next intersection I choose to go to the left following the path that led to the front of the field. It then bears right following the stone wall by the road back to the entrance road. I saw a rabbit along this stretch. From here I turned right and made my way to the car. Besides the described route, I also did some slight exploration of side paths. I saw several birds including a red tail hawk here. It is highly advisable to stay away the edges of the paths as there is a lot of poison ivy here. Dogs are not allowed here from April 1 to August 31 during nesting season. The rest of the year they are welcomed on a leash. 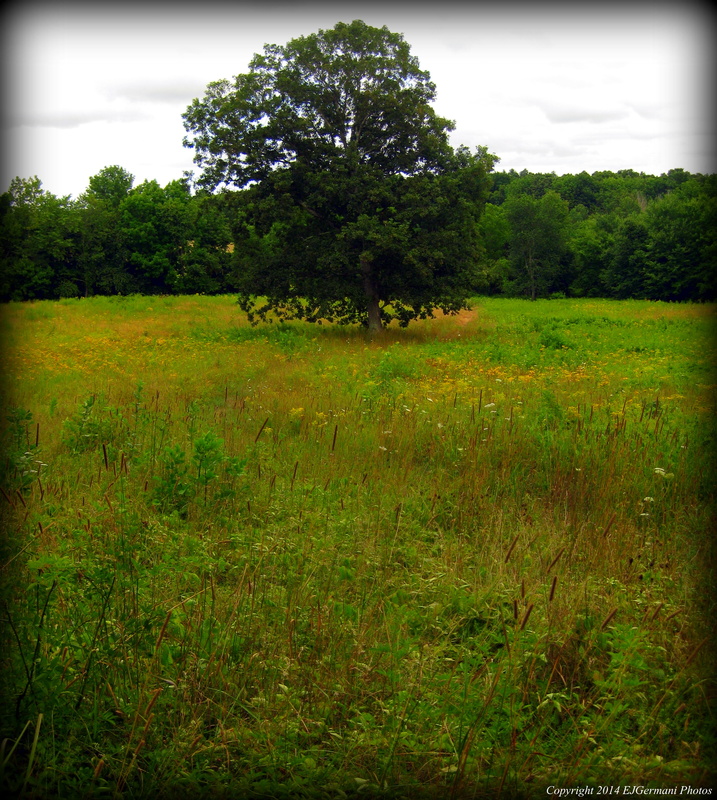 Just outside of the village of Clayville is Westconnaug Meadows. This property, owned by the Scituate Land Trust, offers a short trail that is just over a mile long. It is a good hike for beginners and children. The trail head is at the parking area for the ball fields on George Washington Highway. The trail enters the woods by the stone wall. There is a sign here at the trailhead. The trail first crosses two small boardwalks before turning right into the thick of the woods and slightly uphill. This first section can tend to be a little muddy in wet conditions. Along the way there are several signs describing the types of trees such as the black oaks, red oaks, white pines and sassafras, to name a few. The trail then comes to a fork. Stay to the left here and follow the trail downhill a bit. The trail soon starts bearing right and slightly uphill. This part of the trail is a loop. You will soon see yellow blazes on trees to your left. This marks the property of the Scituate Reservoir – you are not allowed to cross onto that property. There is small overlook along this stretch that gives you a view of the property to the west. If you look closely you will see a small stream below. 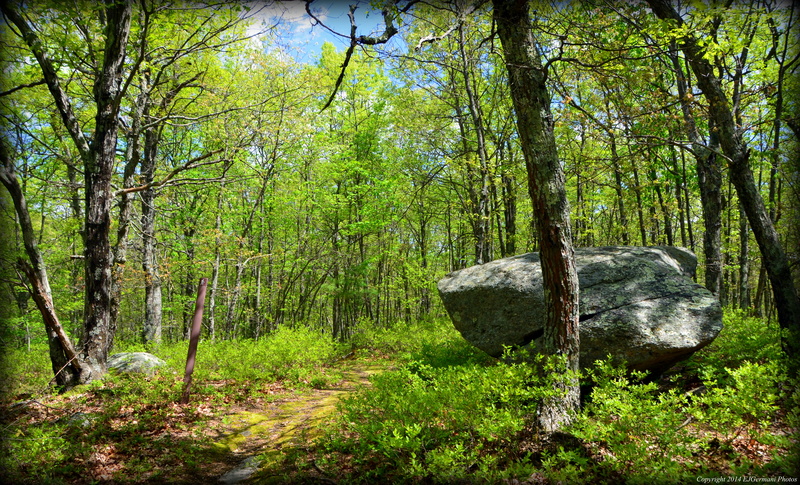 The trail slowly takes a series of small right turns passing some boulders left behind from the days of glaciers. Soon the trail returns to the fork. Here, you turn left retracing your steps back to the parking area. The entire trail is marked with brown plastic trail markers and is very easy to navigate. 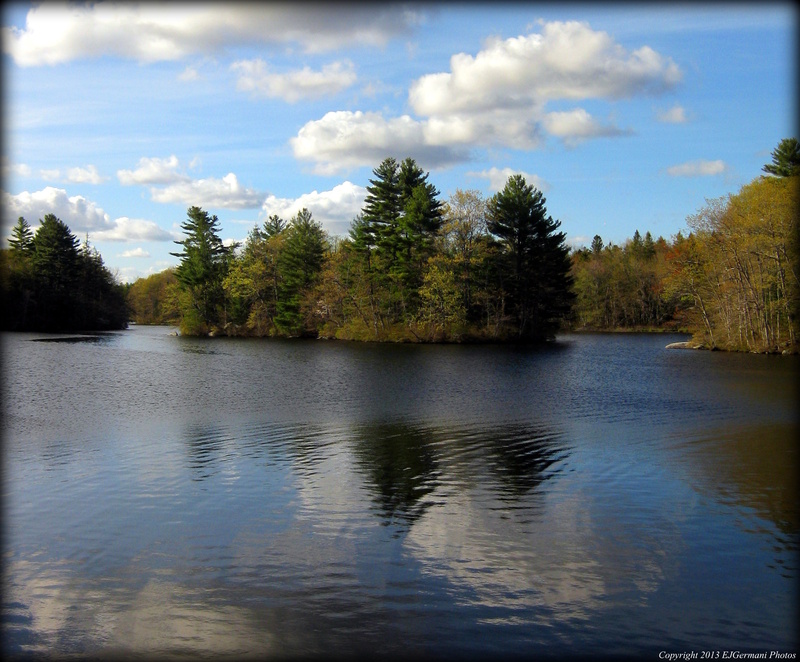 The property is well-preserved and well-maintained by both the Land Trust and the Conservation Commission. I was tremendously surprised by this hike – I may chalk this one up as one of the most peaceful, serene and quiet hikes I’ve enjoyed yet. About midway into the hike, I found myself in complete silence – other than the sounds of the chirping birds and the breeze blowing through the various types of trees. Without any doubt, I would consider this one of Rhode Island’s best kept secrets. 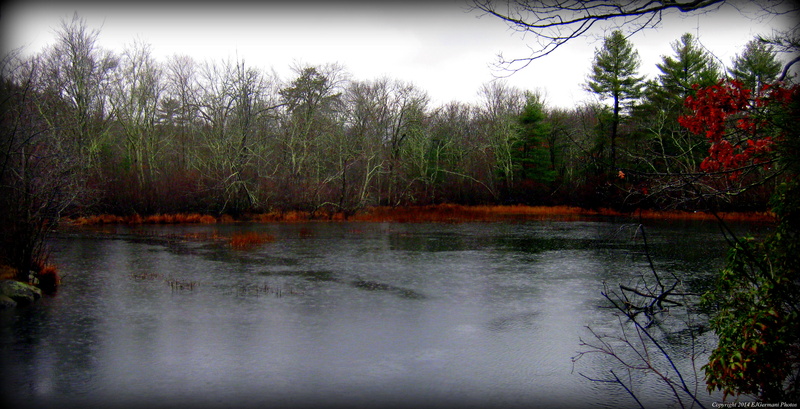 I came across this location for a walk in Ken Weber’s second edition of “Walks and Rambles in Rhode Island”. The book was printed in 1993 and described a walk that was nearly 3 miles long. Times have changed since then and it seems that most of the areas described in his book may be off limits now. With that said, the walk I’m going to describe is more of a walk for exercise and a chance to get a great photo of the Scituate Reservoir. Just west of where Routes 116 and 12 meet there is a former intersection on the right. There is a road that is now closed and barricaded but there is just enough room to park a few cars. If you park your car here and walk west to the opposite end of the dam, it is 0.7 miles. To your right before the actual dam is a monument to the person the dam was named for. After the monument and to the right is the reservoir. To the left is the earthen dam and access roads below. The spillway is at the end of the dam on the left. This is where the north branch of the Pawtuxet River begins. Use caution though, as there is no actual sidewalk and only a narrow grass strip. Cars and trucks do pass rather fast along this stretch.